We love our customers! And we do everything we can to take care of you. We'll jump through hoops to delight you. We are always available - you can come visit us at our store, email us, call us or live chat with us. Take a minute and read some of our recent reviews below. Let us delight YOU. Read more verified reviews from Reviews.io. Sales person Danielle was excellent. Will recommend for sure. Your personal attention to my order and your excellent service were above and beyond what I expected. Thank you, and keep doing what you're doing. I highly recommend Titanium Jewelry! I usually don't click on ads but theres caught my eye when I happen to be looking for a wedding band. I am not a big jewelry person so a $1200 gold ring was not necessary. When I saw the one I had chosen, it seemed too good to be true. Style and durability? Then can the price, I double checked other sites for the same ring and at that time it was $165 cheaper. So I took a chance with a size (9) I didn't think would fit(out of 9.5), but everything went in my favor and fits perfect! So I saved over $1000 for something that has just as much meaning and symbolization as the over priced gold version. Thank you Yates family. The product is great, the presentation of the package it came with was great. Didn't know the timeline of shipping and didn't hear much after credit card had already been charged, so it was nerve wracking to think it could have been a scam. Maybe they could have stayed in contact a little better. But overall I am satisfied. People here are very friendly and get right back to you with answers to questions. Product is excellent, just as you would expect. High quality. No need to find out how easy the return is because there won't be one! I was a little hesitant to order a ring online without actually seeing it in person and from a jeweler that I had never heard of before but they ended up being fantastic. They were very helpful when I called and made me feel at ease with my decision....also having the best prices made it even better. I look forward to doing more business with them!!! I couldn't have asked for better service, fast shipping, great quality, Very thankful that this discontinued item was available on your site! Not only are their rings beautiful and unique but I love their "Ring for Life Sizing Program." I purchased my ring in 2006 and after 9 years I needed to exchange it for a new size. Fortunately they still had the same design but it was from a different manufacturer. They still exchanged it with absolutely no hassle. This is a wonderful company to do business with! Fast, courteous service in replacing our damaged ring! Without hesitation I would recommend you to others. The customer service was outstanding. I was kept in the loop on my order status and projected date my ring would be finished. There was an issue with the post office accepting my address so the jewelers paid out of pocket to upgrade from USPS to UPS at no cost to me. Phenomenal job. I received some of the best customer service I have ever experienced. They communicated efficiently and were very quick to help me and go above and beyond. My ring I got was excellent quality. I highly recommend! Product was as expected. My only comment would be that while they offered a two day shipping, the item did not ship foe a few days after ordering. This meant that receipt of the item was more like a week after ordering. 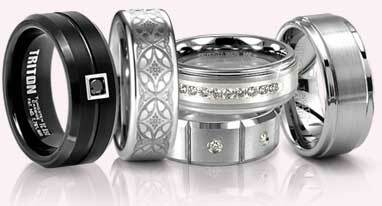 I found the service I received from Titanium Jewelry very satisfactory. Even when I needed to swap out my ring as the original ring was too big, it was easily taken care of just by giving you a call and sorting out the details. Thanks sooo much for the great service. There was a slight problem in shipping. Scott was able to make sure the ring was delivered on time for our anniversary, and even upgraded the stone at no extra cost. That's good service. Thanks, ***! I had to do 2 returns to get the right size. Not the fault of the store at all. However some guidance about the fit might have helped, We used a ring sizer at a jewelry store for initial sizing, but the style of the ring - convex against the finger makes it fit a bit differently. They were accommodating in handling the exchanges but the shipping was slow and I thought pricey. Very happy with the product - a titanium ring. You asked me to complete this survey to help you improve your service. My advice...don't change a single thing. This was the 2nd time I bought something from TitaniumJewelry.com. The first was 6 years ago and both times I got a great price as well as great customer service. Timely responses to questions, email notices regarding shipping and everything they said they would do happens in the time frame they say it will. This goes for their vendors too. I wish every company I dealt with had customer service up to this standard of excellence. I have recommend it to a friend who has also make purchases from the site and was extremely satisfied. This company has the best products and you cannot beat their service. If you are buying remotely, this is the closest experience as being on a jewelry store. They send you detailed pictures, take their time to explain and show you their options, honestly this is the best online experience I've ever had. Third time customer. Lost my wedding band and they researched to find the size I was. Ordered the new one and looks just as nice as the last one! I'm sure I'll be back! I ordered a meteorite wedding ring for my husband. It took about 3 weeks to make it. Great communication - I actually got the store manager on the phone every time I called. (kind of a rarity nowadays...) Benjamin loves his ring. Would buy from them again. Loved the custom damascus steel wedding band we ordered. Turned out perfectly! Thank you so much for delivering the perfect ring. I lost my wedding band over a month ago�this exact ring�and I have been searching everywhere for my size. I have dealt with 3 companies, rude people. I knew the ring and I knew the size but, nobody else could seem to deliver the correct product. Ive been sent wrong sizes�twice, I've been sent the wrong ring once, and I even tried to order one off of eBay that was incorrectly marked on the size. You guys delivered my exact ring on the first attempt. I appreciate the packaging, and the delivery of the box and even the bag. Everybody else literally shipped the ring in a plastic bag and tossed it in a junky envelope that was trashed by the time it arrived in my hands. I can�t thank you enough for replacing my ring that has been on my finger for 10 years. I will definitely send you some future business. Thank you again! I wanted to say a HUGE thanks! The rings are great, the delivery was super fast and you even sent chocolates, WOW. I'll keep you posted, and again, thank you so much! Here is a picture of Romeo's rings. We received the ring and your wonderful gift yesterday. Thank you so much for your awesome customer service and for the wicked cool flask! We�re more than pleased with his ring and can�t wait for him to wear it everyday. We appreciate everything � have a great weekend! Very good experience. Ordered my fiance' band on Thursday and selected 2 Day Air Shipping. Ring didn't show up Tuesday so I called them. They told me the product page said the ring takes 3 - 5 days to get in, then they ship. And the 2 Day Air Shipping is once the ring ships out, it takes 2 days. Kinda confusing, but the manager was very nice. and I got his ring on Friday. So all's good. Just hope my man loves his new ring! I really can't think of anything to improve their service, They have beautiful jewelry and I do intend to get more from them. I highly recommend them to my friends when they compliment me about the rings I have purchased. Quick... exactly as described. .. very happy! There was an issue / error trying to select USPS for International mail to Australia. I couldn't select it. It turns out they only use FedEx or UPS to Australia. I live chatted with them and they helped me complete my order. Thanks. Very pleased with packaging/ shipping. And extras, pre-printed return forums (if needed), comes in a ring box, not a cheap bag, and free ring sizers. Very very happy with my purchase ! I was very satisfied with the order procedure. I received a personal phone call that the wrong rings had come in and were almost shipped to me and that the right rings would be shipped but later than the date I was guaranteed. I highly appreciated the heads up as most companies would not admit a fault and just leave you hanging if something went wrong. I will definitely order from you again and will recommend you, as well. Thank you! My order was processed online and I was kept abreast of it's disposition with timely email reports. The customer service was excellent. I look forward to doing business with them again. Very professional. Great communication and absolutely wonderful product. Thank you!!! Hi Steven - My wife happened to be home and was able to sign for the package. Ordering was a breeze. Shipping free and the rings are awesome! Second time ordering from them. Will be returning again to order. Outstanding service and experience! I ordered on the weekend and called a couple of days later to inquire about a shipping time. They answered all of my questions over the phone and then followed up with emails very quickly to give me more information and finally an eta for the arrival of my ring. My ring arrived 2 days later. The packaging was excellent and my new ring is amazing! I originally was looking at mokume gane or Damascus steel rings, but I ended up purchasing the timoku because of the excellent color and patterns the combination of titanium and steel produce. It's a smooth fit with just the right amount of texture on the outside to be noticible but not distracting. This is going to be my wedding ring, so I took my selection process quite seriously. Customer service was nice, especially the email and chat feature. Packaging and shipping was secure. Though I wish the specific ring I ended up with had more of the circular wood grain patterns seen in the photos - mine ended up being 90% just the striped part of pattern, like a zebra - I am content with the purchase and would recommend it to others. Beautiful, very happy with the necklace & I think my man will be too. Great experience purchasing through Titanium-Jewelry. I received my jewelry on time....well earlier than expected. It was exactly as presented on the website.....absolutely gorgeous! The ring looks amazing and we are totally satisfied! It was an easy ordering process! Just can't say enough great things! We bought a new ring to replace the wedding ring my husband lost. Instead of regular titanium he had originally, we went with the black titanium. My husband absolutely loves it! It fit perfectly and looks absolutely flawless. The only remotely negative thing he said about it is that it was a tiny bit heavier than his original one BUT he can still barely tell his is wearing one because it is so lightweight. It's the second ring we have bought from Titanium Jewelry and great service product arrives as shown. The service and communication was awesome! Ordered my ring and instantly started receiving emails with updates... Order status and then shipping information. Shipping was super fast with easy tracking through UPS. Once I received my ring, there was a hand written note inside thanking me for doing business with them and letting me know they would help with anything else I may need in the future. Great company to deal with and look forward to doing business with them in the future! Not only did my soon-to-be hubby's ring arrived earlier than expected, but a hand-written thank you note was included in the box from the sales assistant thanking me for letting her be a part of this journey. That REALLY stood out to me in terms of customer service. Thank you! The customer service is excellent. The only issue was the Postage Selection for outside the US it selection process is a bit ambiguous and there was a lot of confusion on why it would not process the order, the USPS selection does not register but having selected Fedex it was plain sailing. At all times I was in contact with a sales person on the web chat which made it all a lot less stressful. Overall very satisfied with the sale and would recommend without hesitation. Excellent customer service. Great prices. Shipped fast. Received well before the estimated " allow 2 weeks delivery." Will definitely buy from again. Thank you. When my piece of jewelry arrived I was stunned at the care put into the package. This is a great company and I truly appreciate your work. Thank you! Service was great. The ring reached us before the anticipated date given when we ordered. Good under promise and out perform. Would definitely recommend. Pros: The service was great. Called and emailed the staff and they kept me up to date with my order. Cons: I ordered my ring the 4th and even paid an extra 80$ to get it shipped priority *** so I could get it on time. It shipped out however the 12th due to delay at the factory. And it is now the 19th and I still have not received the ring I ordered. It's disappointing because I wasted money to get it quickly. If I knew this was going to be the case I would have shipped with the standard mailing. I am still waiting for my ring and I hope the wait was worth it. That will depend on the quality of the ring. Staying hopeful.